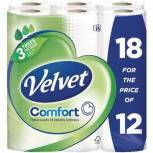 Velvet Comfort Toilet Roll (Pack of 18) KSCATV18 Pack of 1 Triple Velvet toilet roll. 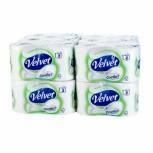 Luxuriously soft strong toilet tissue. 3-Ply tissue with a dimpled middle layer. Average 200 sheets per roll. Sheet size: 120 x 109mm. 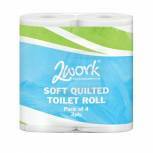 2Work Luxury 2-Ply Quilted Toilet Roll 300 Sheets (Pack of 40) DQ4Pk Pack of 1 Luxury toilet roll. 2-Ply quilted construction for added comfort. Supplied in 10 packs of 4 rolls. Colour: White. 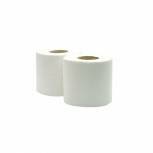 2Work 2-Ply Centrefeed Roll 150m White (Pack of 6) KF03804 Pack of 1 Eco Friendly 100% recycled paper rolls. 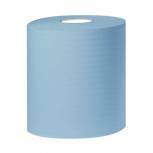 Versatile paper rolls ideal for wiping, mopping, drying and polishing. 2-ply. 150m. Colour - White. 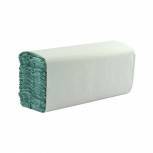 1-Ply Green C-Fold Hand Towels (Pack of 2850) WX43094 Pack of 1 1-ply, C-fold hand towel for drying hands. Can also be used for wiping and drying surfaces. 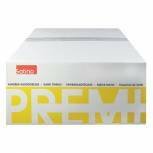 Perfect for maintaining a hygienic environment. Great value product. Absorbs all liquid with ease. Colour: Green. 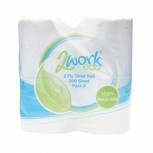 2Work 1-Ply Multi-Fold Hand Towels White (Pack of 3000) 2W70583 Pack of 1 2Work Multi Fold Hand Towels. Interleaved to offer single dispensing to avoid wastage. Towel size: 242 x 222mm. Single ply. Colour: White. 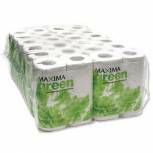 Maxima Toilet Roll 320 Sheets (Pack of 36) 1102001 Pack of 1 Maxima 320 sheet toilet roll. 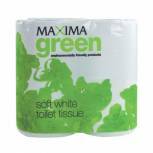 Two ply soft and strong white toilet rolls made from 100% recycled paper. In bulk packs of 36. Insette Wild Berries 300ml Air Freshener 1008167 Pack of 1 Eliminates odours effectively. Leaves areas smelling fresh with wild berries fragrance. Ideal for any reception or public use area. Handy to have in the home to eliminate unpleasant odours. easy to use aerosol can. Capacity: 300ml. Non returnable. 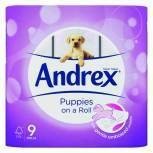 Andrex Puppies on a Roll Toilet Roll (Pack of 9) 4978748 Pack of 1 A perfect balance of softness and strength embossed with andrex puppies. High quality tissue. Colour - White. 2Work 2-Ply Jumbo Toilet Roll 60mm Core (Pack of 6) J26400VW Pack of 1 2Work Jumbo Toilet Roll Refill 2-Ply. 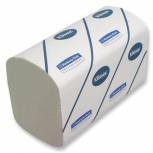 Hygienic toilet tissue for use in the Jumbo Dispenser CT34025. 410m x 92mm. 60mm core. 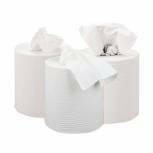 Kleenex 2-Ply Ultra Hand Towel 124 Sheets (Pack of 15) 6778 Pack of 1 Ultra 2-Ply hand towels manufactured from highly absorbent Airflex. 116-sheets per pack. Sheet size - 315x215mm. Colour - White. 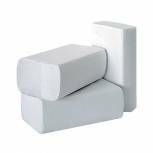 See KC01197 for wall mounted dispenser. 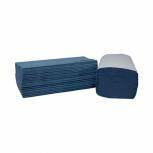 2Work 1-Ply I-Fold Hand Towels Blue (Pack of 3600) 2W70104 Pack of 1 2Work Single Fold Handtowels. Interleaved paper towels for use in the wall dispenser (CT34069). Colour: Blue. Size: 190x250mm. 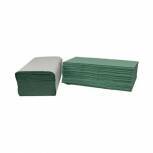 2Work 1-Ply I-Fold Hand Towels Green (Pack of 3600) 2W70105 Pack of 1 2Work Single Fold Handtowels. 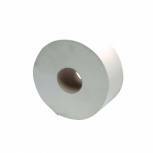 Interleaved paper towels for use in the wall dispenser CT34069. Green. Size 190 x 250mm. 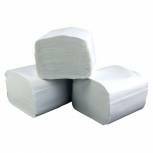 2Work Recycled 2-Ply Toilet Roll 200 Sheets (Pack of 36) KF03809 Pack of 1 Soft and strong 2-ply toilet tissue. 200 sheets per roll. Colour - White. (See 43612 for dispenser).